Yvon Lambert is pleased to announce the 9th exhibition dedicated to Andres Serrano from the 28th of November 2013 until the 16th of January 2014. 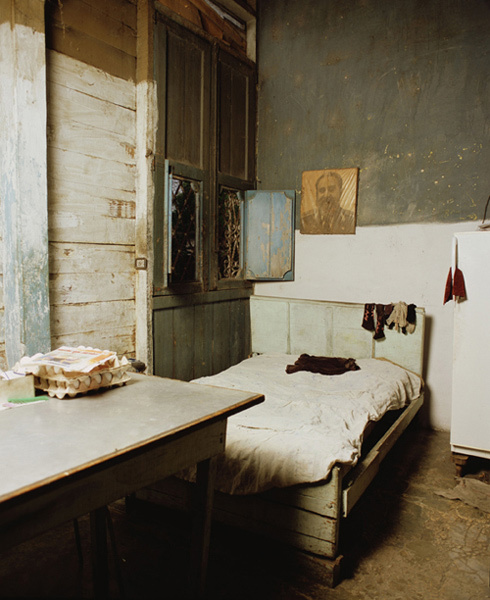 For this new exhibition, the photographer will present about twenty pictures coming from his new photo serie «Cuba». This serie of photographs, by the acclaimed American photographer, born in 1950 in New York, began in May 2012. It was the first time that he went to the country where his mother grew up (she was not born there but spent her childhood and youth in Cuba). He consequently forged a complex relation with Cuban culture: Spanish is therefore his mother tongue, and if he has always been surrounded by these influences – whether it is the language or state of mind – he still had a lack of intimate knowledge of the country, its political state or its history. It is, consequently, without any forged prejudice or ideas that he accepted the invitation of the Havana Biennale to discover Cuba in order to make an important work in situ. The living room of a private house is quickly turned into a photo studio and thanks to his local assistants, Serrano is able to take portraits of intellectuals, musicians, artists, writers but also unknown persons that he met through discovering the city. Like in his famous portrait serie ( Nomads, America or The Clan), the sitter is often depicting as a representant of a social group, monumentalized against a blank background, in front of the camera which captures the shadows around his face and the different textures and bright colors of his clothing. The photo serie presented for the occasion of the exhibition in Paris is a selection among hundreds of pictures, which gives an overview of the discovery and appreciation of a country that appears to us as odd familiarity. The Cuba serie, therefore, develops a true portrait of the country, not like a photographer who documents a subject, but as an artist who uses photography as a way to recreate his own reality.